Recommend your friends and family to our home health care agency. Schedule an appointment for a home health needs assessment. 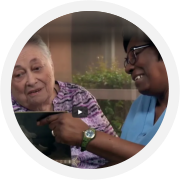 We are the preferred provider of home care services in Broward and Palm Beach counties. It is such an honor to receive your commendations. We will be posting testimonials on our website from time to time. Your testimonials will inspire us to remain consistent in our home health delivery.